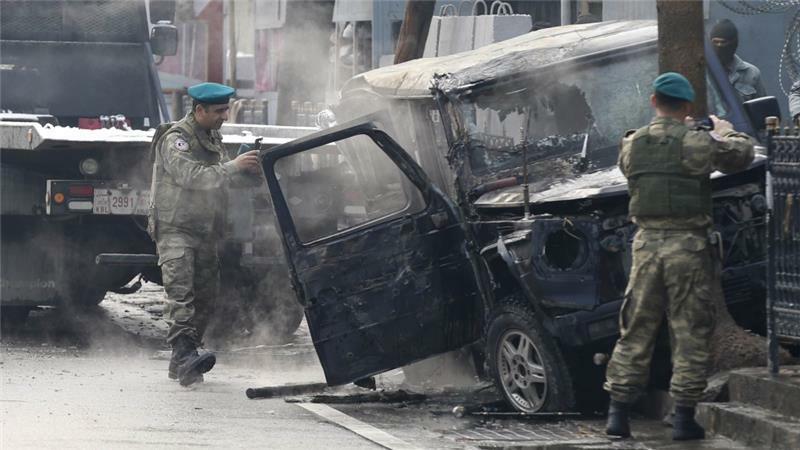 A Turkish Embassy Vehicle was destroyed in an attack in Kabul, Afghanistan. A suicide bomber driving a car packed with explosives has targeted a vehicle of the Turkish embassy in the Afghan capital during the morning rush hour, police and Afghan officials said. One Turkish national and an Afghan passerby were killed in the attack on Thursday morning, a police spokesman said. Deputy Interior Minister Mohammad Ayub Salangi said a Turkish embassy vehicle was damaged and casualties were expected, the AP news agency reported. “The target was a Turkish embassy vehicle,” he told media. The Taliban swiftly claimed responsibility, saying it had targeted a convoy of foreign forces causing many injuries, the Reuters news agency reported. The group often inflates casualty claims. The Turkish and Iranian embassies are adjacent in the centre of Kabul. The blast took place outside the gate of Iran’s mission. It was the second time an embassy vehicle has been targeted by attackers in the capital in recent months, after a British car was hit by a suicide bomber in November.